When mobile phone makers look for inspiration for future products, one would expect they look to science fiction. But Yrjo Neuvo, Chief Technical Officer of Nokia mobile phones, reads JK Rowling's Harry Potter to get him thinking. 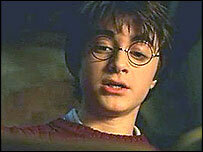 "I have read all the Harry Potter books, including the last one," he told BBC News Online. "And when you read them with my kind of mindset, technology orientated, I always ask myself how we can implement that." JK "is very good when it comes to predicting the future", according to Dr Neuvo, and "many of the things she is painting in her books can be implemented in phones in five to 10 years. It's really exciting," he says. The ghostly moving people in framed pictures which deck Hogwarts' staircases, and the mysterious pensieve which shows 3D images of memories are just some of the ideas he sees as a reality. Nokia have already developed a picture frame, available later this year, which lets people to beam images onto it directly from their phones. Of course, there are no plans to make Nokia handsets which double as Nimbus 2000 quidditch brooms, sadly. For the world's largest mobile phone manufacturers, as they prepare to launch new innovative models, their concerns are to "predict the unpredictable and unfold the future," says Dr Neuvo. Image Frame: Just like Harry Potter? Their mobile phone strategy is centred around the predicted huge growth in the convergence of mobility, business, home and internet domains. Whether that means being able to remotely connect to workplace databases and e-mails, sharing pictures, music or video with your gadgets at home, the mobile is going to be central, as far as Nokia are concerned. This is why they are developing different design styles which might emphasise the screen over the size, for instance. This is supposed to give people a choice of handset type, depending on what they like doing best with their mobiles. If it is watching streaming video or MMS-ing (Multimedia Messaging Service), the 3G "imaging phone" the 7600, has a large central screen at its heart to do that. But more widely, all new Nokia phones in 18 months time will have what they consider to be core functionality in them. "Cameras will be a natural part of the everyday phone," says Dr Neuvo. Other key elements which will come as standard include colour screens, cameras, MMS, polyphonic ringtones, and a range of PDA (Personal Digital Assistant) functions like calendar and diaries. But Nokia are not complacent about the big challenges ahead for mobile makers. Higher data transfer speeds, and more applications which are being developed as software platforms become more open, mean people will want more memory capacity to store all our pictures, videos and audio. Phones will start to be seen more like computers in terms of memory and storage capacity. "Having gigabytes of memory in products will be realistic in 10 five years time," thinks Dr Neuvo. "But we cannot just copy laptops. We cannot sacrifice the operating power for this." Having high performance products with low power consumption is the challenge, and for that there needs to be better power sources. Issues around heat generation, particularly in smaller gadgets is a problem, and Nokia among others are working to find ways around that. Understanding the phone and software architecture is crucial to this future development, particularly as people demand smaller sizes. "Miniaturisation is important in all categories. If you can miniaturise certain parts, then that allows you to do more with camera size," says Dr Neuvo. "But usability becomes a challenge then. The key is to make a really small attractive phone for those who want it, but also for multiple device owners who want to take a smaller phone to a party." Nokia is playing around with the idea of small devices, experimenting with jewellery. At the moment, the jewellery is in the form of a pendant which can store beamed images from phones. You cannot make a call on it yet, but people will want to experiment themselves as technologies become more wearable. "But that is why we launched that, to show that one day we will have a cool phone that you can do that with," explains Dr Neuvo.